Glamorgan's overseas batsman Jacques Rudolph has set himself a target of scoring early runs. 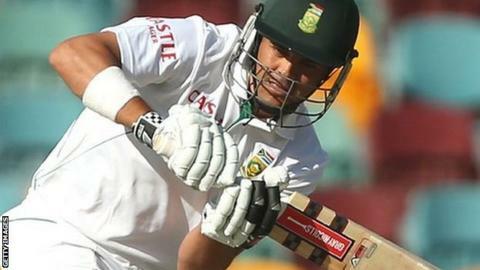 The former South African Test opener arrives in time for the Welsh County's second LV Championship match against Gloucestershire on 20 April. And Rudolph, 32, believes putting down an early marker could be the key to a successful season. "I've found in the past that if I can do well in the first few months it always helps to sustain you," he said. "The one thing I'd really like to do is try and get early momentum as opposed to starting scratching around - sometimes it can get a bit tough then." Rudolph's late arrival in Wales is the result of a long-standing commitment to take part in the South African Ironman event in Nelson Mandela Bay on Sunday. He says the decision to enter came after he watched the 2013 event and Glamorgan have given their blessing for him to take part. Two weeks before he is due to be opening the batting at the Swalec Stadium, Rudolph will swim 2.4 miles, ride a bike for 112 miles and round it all off by running a marathon. "I have a list of things I want to do and I've always felt inspired when I see these races, and when I see people like Chrissie Wellington," said Rudolph. Rudolph will have a four-day break after the event before flying to Britain to join up with his new county. He believes his previous county experience with Yorkshire and Surrey will help him settle in at Glamorgan. "The fact that I have quite a bit of county experience and I've done fairly well over there makes me really excited," said Rudolph. "I'm very excited about about Glamorgan, I've heard very good things about them and I think they're going to have a very good season. "I don't specifically have runs goals, [but] I think it would be nice to get more than 1,000 runs for the four-day competition. "I think it will be nice to get Glamorgan from second division into the first division." Glamorgan batting consultant Matthew Maynard coached Rudolph at the Titans in South Africa and believes the Welsh county have made a good signing. "The first year I was with the Titans he played brilliantly well and forced himself back into the south African side," said Maynard. "He's adaptable and I think that's what's going to be key for Glamorgan in the early season. "As well as opening he can bat in the middle order, and is a pretty good Twenty20 player. "He's a real fine signing and I just hope he still has that drive to succeed."